Well Vegan is a brand the Bureau created in 2012 and continues to work with today, including this most recent piece. Well Vegan makes it easier and cheaper to consistently follow a healthy, plant-based diet. In the past we had made postcards for Salad In A Jar and Building the Perfect Breakfast Bowl. 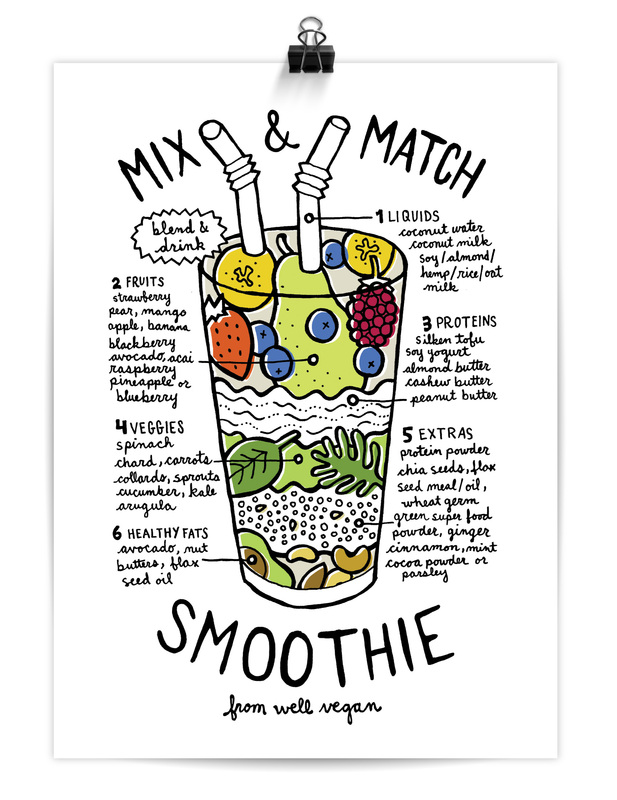 With summer coming up, it seemed like a perfect time for a follow-up postcard as a reminder of just how good smoothies can be (for you) – so we’d like to introduce the Mix & Match Smoothie diagram! Visit the Well Vegan blog for some smoothie recipes as well as time-saving and on-the-go tips, or check out this handy line-up of green smoothie recipes. You can also get tasty updates from Well Vegan, including a summer full of smoothie recipes, via Twitter or Facebook or Instagram.